The Harvard Classics: Launch Post! 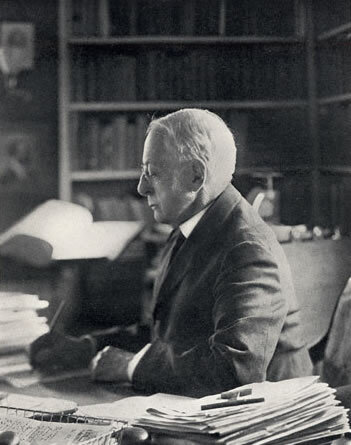 Charles William Eliot (1834-1926) is on a pedestal as the “grand old man” of Harvard University – its transformer, if not its founder. The university was established in 1636, making it the oldest institute of higher learning in the United States and the most highly honoured. 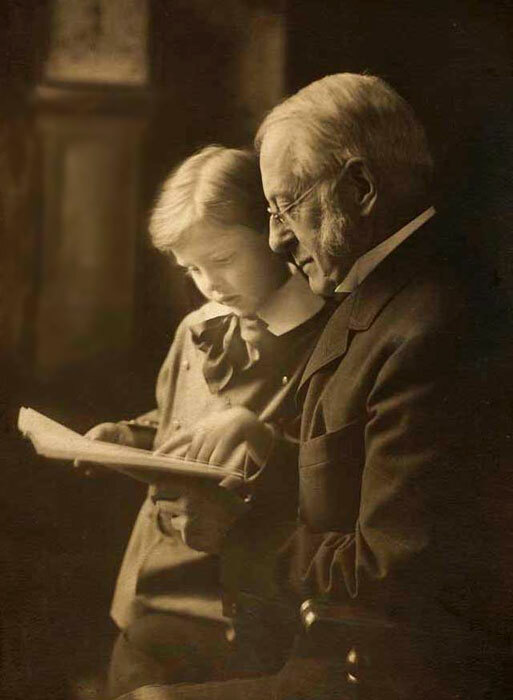 Charles W. Eliot came to the presidency in 1869 and served for a grand total of forty years, retiring in 1909. His reign oversaw the founding of Radcliffe College (among other things). He also was the first to emphasize a student’s ability to choose their own courses, to abolish knowledge of Greek as necessary and to allow his students to skip chapel. A forward thinker, by all accounts. Though I’m not sure about the Greek. What harm did learning Greek ever do? Concerned as he was with education, Eliot set his mind to selecting a set of books which he considered necessary for a “liberal” education. It took him a year. “Dr. 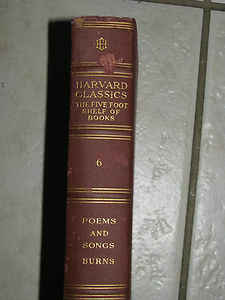 Eliot’s Five Foot Shelf,” properly titled The Harvard Classics, were published by P.F. Collier and Sons in 1909 to amazing success (350,000 sets sold within 20 years!) and a series of endless reprintings. 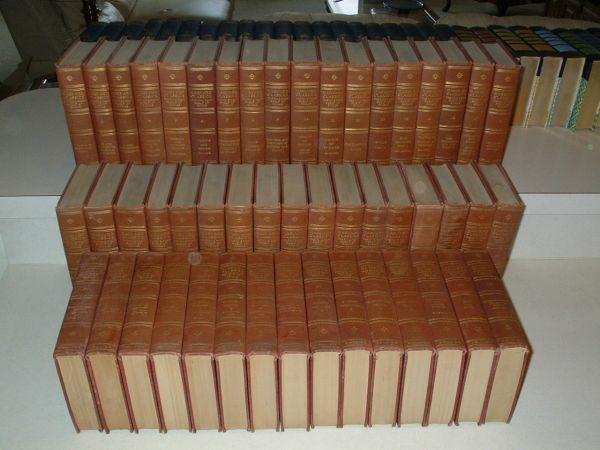 You can find sets and individual volumes on Ebay anytime you care to look. Each volume is roughly 400-450 pages long and they do in fact fit perfectly on a five foot shelf. This is where I come in. Summer 2008, garage sale season in Minnesota. My mother and brother were out shopping and in the basement of one sale they found several heavy boxes of books. The man said “if you can carry them out, they’re yours.” The boxes had been there since the man moved in and he was so glad to have them removed that he didn’t need payment. What came home from that trip included stacks of turn-of-the-century potboilers, Tom Sawyer, Cass Timberlane, an “authorized edition” of O. Henry stories and a near-complete set of Harvards, 1909 edition. A bit of time was spent replacing the ones that were water-damaged and in acquiring the missing volumes and the net result was and is a complete set, albeit with one of the replaced volumes accidentally from a different printing. In an ambitious moment I decided to actually read them. Currently I’m on volume 4, The Complete Poems in English of John Milton. Speaking generally, the Harvards do not make for riveting reads. Eliot was comprehensive (in some ways – I’ll get to that in a moment) and included papers on health and science that probably wouldn’t interest many of those people who read literature, philosophy and history for pleasure. Simon Newcomb’s The Extent of the Universe therefore sits alongside friendlier writings such as The Autobiography of Benjamin Franklin and The Prince. Very few of the authors get whole books to themselves and so are crammed together in themed volumes – a quick glance through a listing of them calls up names such as Edmund Burke, Louis Pasteur, Pedro Calderon de la Barca, Sir Walter Raleigh, Epictetus…. True, there are some baffling decisions, chief among them giving Scottish poet Robert Burns an entire book to himself, but for the most part the selection is incredibly sane and logical. Was it meant to be read in order? No idea, but that’s how I’m doing it. The above is just a taster. I’m not going to give a run-down of the entire list; rather I am going to briefly address the problem of who didn’t make the grade. Yes, The Harvard Classics consists almost entirely of “dead white males.” Those who find this un-PC, unenlightened or unimpressive would not enjoy reading the five foot shelf. Admittedly, the two volume Sacred Texts manages rather well with Confucius, the Koran, the Bhagavad-Gita and Buddhist writings alongside the Biblical selections, but elsewhere forget it. The only women to be found are in the poetry section – no “hyena in petticoats” here, nor is Margaret Fuller anywhere to be seen. Charles W. Eliot apparently was supportive of the civil rights movement, but his chosen representative on the subject of slavery was the Quaker John Woolman. No Frederick Douglass. No Booker T. Washington. No W.E.B. Du Bois. Please note that I shall not be calling undue attention to this fact as I read. I won’t be lambasting Ben Franklin for his politics nor John Milton for his attitudes towards women. Passing judgement on unenlightened eras from the point of view of our own unenlightened era interests me not. So I’m clearing the boards on this matter here. This is far more fun to take note of. By 1909 Darwin wasn’t radical anymore and his two major works are included. But Karl Marx? Oh no, he’s not here. Forget it, his writings didn’t make it to Harvard. Perhaps it’s not surprising…. Meanwhile, no Thomas Paine. I don’t think Eliot approved of atheists and agnostics. Voltaire did skate through with his ‘Letters on the English,’ but the crowd is overwhelmingly Christian – Luther, Browne, Bunyan, More, Woolman, Kempis, etc. “Liberal?” Seems more like conservative to me…. The arts suffer badly in this set. Perhaps only drama really escapes – Greek, European and English both old (Elizabethan) and “new” (Goldsmith, Byron, Sheridan, etc). Poetry in English is quite well represented – three volumes worth – and I’ve already mentioned the Milton and Burns, but in translation only epics make the cut – Beowulf, The Song of Roland and Dante. No Chaucer and Homer doesn’t count as his is a prose translation. Eliot also put together a shelf of literature but that must have been later. For this set he chose three novels: The Pilgrim’s Progress, the first half of Don Quixote and I Promessi Sposi. The logic of these selections (specifically the last one) escapes me. Presumably they are educative in some way and I will better understand when I read them. Other than the Don Quixote abridgement, there are a few other problems for completists. Only the first half of Hobbes’ Leviathan is included. The Thousand and One Nights is naturally represented by the merest slivers. Sophocles’ underrated Oedipus at Colonus is missing and thus his Oedipus cycle is robbed of a third its power. And strangest of all, The Odyssey is here, but The Iliad was ignored. Spacial concerns? Most likely. If you consider it, Eliot’s was not an enviable task. And the Boat Sailed Without…. Historians from Herodotus to Gibbon. Writers on war from Sun Tzu to Clausewitz. Lao Tzu. Aristotle. Cicero’s murder trials. Plato’s Republic. The Memoirs of Ulysses S. Grant. Kierkegaard. Etc. Etc. Etc. I don’t mean to put Harvard down, only to point out that in choosing to read my way through it I have also chosen to supplement and update it. By themselves the volumes do not form “all one needs” for any education nor do I think they ever did – the last time it was possible to have a complete education was during the Renaissance, I believe. So this is my long-term project: to write about The Harvard Classics. I began in 2009 and have managed to read one a year (as I said, it’s not riveting stuff). Blogging about them has been always a long-term plan and my first goal shall be simply to catch up to my current read, Paradise Lost. Posts on these subjects shall be sporadic. Comments are welcome. I would love to hear from anyone else who’s read them, is reading them, has read parts of them elsewhere or who just thinks it sounds like a good idea. A chorus of onlookers may give me added incentive to pick up the pace but this is still going to take a while….. I really like what you said about complete education only during the renaissance. Thank you. Thank you very much indeed. I wasn’t really expecting comments on this piece and it’s heartening to see otherwise.